Hmmm, I may have a bit of an R2-D2 problem. I don't know how, but over the year's I've managed to acquire quite a lot of R2-D2 memorabilia some cool, some not so good. I even managed to get suckered into buying a full-size R2-D2 lamp/table for the office last year. 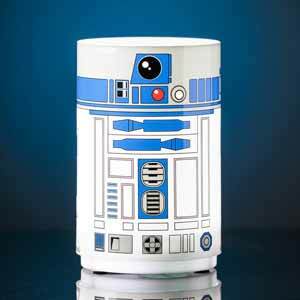 So pretty much anything made to resemble R2-D2 I almost instantly love (because I still haven't grown up yet). 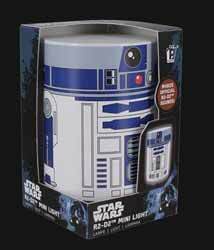 When this R2-D2 light arrived for review I was already won over before I got it out of the box. It's 12cm tall and takes 3xAAA batteries. It's more of a mood lamp than an actual light to brighten up a dark corner. But it looks cool at night or in the day. But the highlight is that when you switch it on (by pushing down on it) it makes a series of R2-D2 beeps and whistles. It's the perfect stocking filler for that Star Wars fan who has everything, and it creates a romantic, ambient light in any room.